A ISIL fighter carrying the militant group's flag on Tall Dabiq which overlooks the town of Dabiq in 2013. Libya: estimates vary; 5,000–6,500 (Feb. 2016, New York Times citing Pentagon officials); "about 5,000" (Feb. 2016, al-Jazeera citing "security analyst); "up to 6,500" (Feb. 2016, CNN citing "several U.S. intelligence officials"). Jordan: several thousand members of jihadist Salafist groups in the country that have pledged allegiance to ISIL; belong to (Jordan Times, 2014). Several Jordanian jihadist ideologues have endorsed ISIL. ISIL sleeper cells exist in the country (about 20 have been killed by Jordanian security forces, and many more arrested, from 2014 to April 2016). Over 2,000 Jordanians have become ISIL foreign fighters in Iraq and Syria. Egypt: between 500 and 1,000 members of ISIL's Sinai Province, primarily in North Sinai Governorate where Sinai insurgency is ongoing (May 2016, Wilson Center estimate). 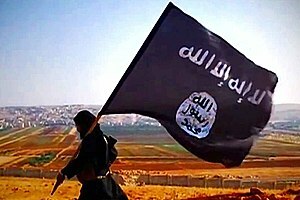 Jammu and Kashmir, India: about 30 youth from area believed to have become ISIL foreign fighters (October 2014, Times of India citing security agencies). The military of ISIL is the fighting force of the Islamic State of Iraq and the Levant (ISIL). The total force size has been estimated from tens of thousands to over two hundred thousand. ISIL's armed forces grew quickly during 2014. The ISIL military, including groups incorporated into it in 2014, openly operates and controls territory in Syria, multiple cities in Libya, and Nigeria. In October 2016, it conquered the city of Qandala in Puntland, Somalia. It also has had border clashes with and made incursions into Lebanon, Iran, and Jordan. ISIL-linked groups operate in Algeria, Pakistan, the Philippines, and in West Africa (Cameroon, Niger, and Chad). In January 2015, ISIL was also confirmed to have a military presence in Afghanistan and in Yemen. Their military is based on mobile units using light vehicles such as gun-equipped pick-up trucks (technicals), motorbikes and buses for fast advances. They also use artillery, tanks and armored vehicles captured from the Iraqi and Syrian Armies. The Islamic State also captured some aircraft. ISIL has a long history of using truck and car bombs, suicide bombers, and IEDs. They have also deployed chemical weapons in Iraq and Syrian Kurdistan. Other terror tactics include genocide, mass executions (including beheadings), psychological operations through sophisticated propaganda, widespread torture of prisoners, and organized sexual violence and slavery. An ISIL command and control center in Raqqa in 2014. According to the Institute for the Study of War, ISIL's 2013 annual report reveals a metrics-driven military command, which is "a strong indication of a unified, coherent leadership structure that commands from the top down". Middle East Forum's Aymenn Jawad Al-Tamimi said, "They are highly skilled in urban guerrilla warfare while the new Iraqi Army simply lacks tactical competence." ISIL's Military Council is made up of numerous former military officers from the Saddam Hussein era. Commanders have included Haji Bakr, a colonel; Abu Abdulrahman al-Bilawi, a captain; and Abu Ayman al-Iraqi, a lieutenant colonel, who all graduated from the same Iraqi military academy. Abu Muslim al-Turkmani, al-Baghdadi's former deputy, was a Directorate of General Military Intelligence lieutenant colonel. All these men spent time detained in Camp Bucca during the American occupation of Iraq Abu Omar al-Shishani, who served in the Georgian Army before leading an ISIL unit in Syria, also became a prominent commander. ISIL's fighters are reportedly organised into seven branches: infantry, snipers, air defence, special forces, artillery forces, the "army of adversity", and the Caliphate Army. This force structure is largely replicated in each of its designated provinces, with the most skilled fighters and military strategists in each area serving in the special forces unit, which is not allowed to redeploy to other provinces. Parallel to this structure is the Caliphate Army, which is directed by ISIL's central command rather than its provincial leadership. Made up overwhelmingly of foreign fighters, it is deployed to assist in battles across the Islamic State. There is also an all-female Al-Khansaa Brigade tasked with policing religious laws. According to battle reports, ISIL often operates in small mobile fighting units. The group also operates outside areas it largely controls using a clandestine cell system. An ISIL-linked senior militant commander in Sinai told Reuters; "They [ISIL] teach us how to carry out operations. We communicate through the internet, ... they teach us how to create secret cells, consisting of five people. Only one person has contact with other cells. They are teaching us how to attack security forces, the element of surprise. They told us to plant bombs then wait 12 hours so that the man planting the device has enough time to escape from the town he is in." In June 2014, ISIL had at least 4,000 fighters in Iraq. The CIA estimated in September 2014 that it had 20,000–31,500 fighters in Iraq and Syria. The Syrian Observatory for Human Rights estimates that the force numbers around 80,000–100,000 total (up to 50,000 in Syria and 30,000 in Iraq). Reuters quoted "jihadist ideologues" as claiming that ISIL has 40,000 fighters and 60,000 supporters, while a Kurdish leader estimated in November 2014 that ISIL's military had 200,000 fighters. 85–600 Iraqi Kurds may have joined ISIS. Some Syrian rebel factions have defected to ISIL, including the 1,000-strong Dawud Brigade in July 2014. In addition to jihadists and other volunteers, ISIL is known for forcing other rebel groups to fight for it, as well as conscripting individuals. There are many foreign fighters in ISIL's ranks. In June 2014, The Economist reported that "ISIS may have up to 6,000 fighters in Iraq and 3,000–5,000 in Syria, including perhaps 3,000 foreigners; nearly a thousand are reported to hail from Chechnya and perhaps 500 or so more from France, Britain and elsewhere in Europe." Chechen leader Abu Omar al-Shishani, for example, was made commander of the northern sector of ISIL in Syria in 2013. According to The New York Times, in September 2014 there were more than 2,000 Europeans and 100 Americans among ISIL's foreign fighters. As of mid-September 2014, around 1,000 Turks had joined ISIL, and as of October 2014, 2,400–3,000 Tunisians had joined the group. An ISIL deserter alleged that foreign recruits were treated with less respect than Arabic-speaking Muslims by ISIL commanders and were placed in suicide units if they lacked otherwise useful skills. According to a UN report, an estimated 15,000 fighters from nearly 70 countries have travelled to Iraq and Syria to join militant groups, including ISIL. Reuters has stated that according to jihadist ideologues, 10 percent of ISIL's fighters in Iraq and 70 percent of its fighters in Syria are from outside those countries. This is a list of nationalities of foreign fighters in ISIL. This list does not include citizens of Syria, or Iraq. Wilayat Algeria formed from the Algerian Jund al-Khilafah after it pledged allegiance to ISIL. Wilayat Yemen formed from militants in Yemen, including defectors from Ansar al-Sharia and al-Qaeda in the Arabian Peninsula. Wilayat Khorasan formed from the allegiance of militants from groups based in Pakistan and Afghanistan, including Jundallah, Tehreek-e-Khilafat, the Islamic Movement of Uzbekistan and dissident commanders formerly associated with Tehrik-i-Taliban Pakistan. Wilayat Gharb Afriqiya formed from Boko Haram pledging allegiance to ISIL. Wilayat al-Qawqaz formed from dissident militants of the Caucasus Emirate in Chechnya and Dagestan who switched their allegiance to ISIL. Militants of the group Sheikh Omar Hadid Brigade (Palestinian Territories) pledged allegiance to ISIL. Militants of the group Abu Sayyaf under Isnilon Totoni Hapilon and Radullan Sahiron (Philippines, Malaysia). pledged allegiance to ISIL. Militants of the group Sons of the Call for Tawhid and Jihad (Jordan) pledged allegiance to ISIL. The group Islamic State of the Maldives pledged allegiance to ISIL in July 2014. Members of Ansar Khalifah Philippines pledged allegiance to ISIL. And they start using ISIL props in their training. Some Bangladeshi terrorist cells pledged allegiance to ISIL and starts attacking civilians and bloggers. Some members of Jamaah Ansharut Tauhid, including leader Abu Bakar Baasyir and Mujahidin Indonesia Timur pledged allegiance. Abnaa ul-Calipha was formed by some Al-Shabaab dissidents in Puntland, led by Abdul Qadir Mumin, who pledged allegiance to ISIL in 2015. Since then, Al-Shabaab has unsuccessfully attempted to kill these defectors. Jabha East Africa, an Islamist group operating in Kenya, Tanzania, Somalia and Uganda, defected from Al-Qaeda and pledged allegiance to ISIL. Katibat Salman Al-Farisi (Salman Al-Farisi Battalion) was formed by a group of Iranian ISIL fighters in Iran, to fight the Iranian government. The City of Monotheism and Monotheists group, operating in the Democratic Republic of the Congo, has pledged allegiance to ISIL. ISIL claimed their first ever attack in Kashmir Valley that left one police officer dead, following this event, a video recently surfaced of an ISIL soldier named Abu-al-Baraa al-Kashmiri pledging allegiance to Islamic State of Iraq and the Levant under the name of Wilayat Kashmir Abu al-Baraa al-Kashmiri is probably the leader of the group, in the video Abu al-Baraa called on Muslims in the Kashmir Valley to fight the Pakistani and the Indian governments and has criticized the Islamic movement of Hizb-Lashkar-Jaish-Tehreek where he stated that he dissociated from the group and waged war against it, and then he called on element of the other insurgent groups operating in Kashmir and labelled them as "brothers" to pledge allegiance to the Islamic State of Iraq and the Levant and Abu-al-Baraa has continued on accusing the other insurgent groups for working for Pakistan's Inter-Services Intelligence and Abu-al-Baraa continued on calling the group of Ansar-Gazwat-ul-Hind and its leader Zakir Musa to pledge allegiance to ISIL. ISIL is reported to employ child soldiers, known as "Cubs of the Caliphate", for both combat and propaganda purposes. An ISIL tank during the Palmyra offensive (2017). The most common weapons used against US and other Coalition forces during the Iraq insurgency were those taken from Saddam Hussein's weapon stockpiles around the country. These included AKM variant assault rifles, PK machine guns and RPG-7s. ISIL has been able to strengthen its military capability by capturing large quantities and varieties of weaponry during the Syrian Civil War and Post-US Iraqi insurgency. These weapons seizures have improved the group's capacity to carry out successful subsequent operations and obtain more equipment. Weaponry that ISIL has reportedly captured and employed include SA-7 and Stinger surface-to-air missiles, M79 Osa, HJ-8 and AT-4 Spigot anti-tank weapons, Type 59 field guns and M198 howitzers, Humvees, T-54/55, T-72, and M1 Abrams main battle tanks, M1117 armoured cars, truck-mounted DShK guns, ZU-23-2 anti-aircraft guns, BM-21 Grad multiple rocket launchers, and at least one Scud missile. ISIL shot down an Iraqi helicopter in October 2014, and claims to have shot down "several other" helicopters in 2014. Observers fear that they have "advanced surface-to-air missile systems" such as the Chinese-made FN-6, which are thought to have been provided to Syrian rebels by Qatar and/or Saudi Arabia, and purchased or captured by ISIL. ISIL also captured fighter aircraft in Syria. The Syrian Observatory for Human Rights reported in October 2014 that former Iraqi pilots were training ISIL militants to fly captured Syrian jets. Witnesses reported that MiG-21 and MiG-23 jets were flying over al-Jarrah military airport, but the US Central Command said it was not aware of flights by ISIL-operated aircraft in Syria or elsewhere. On 21 October, the Syrian Air Force claimed that it had shot down two of these aircraft over al-Jarrah air base while they were landing. An ISIL car bomb in action during the Siege of Menagh Air Base. ISIL has a long history of using truck and car bombs, suicide bombers, and IEDs. ISIL captured nuclear materials from Mosul University in July 2014. In a letter to UN Secretary-General Ban Ki-moon, Iraq's UN Ambassador Mohamed Ali Alhakim said that the materials had been kept at the university and "can be used in manufacturing weapons of mass destruction". Nuclear experts regarded the threat as insignificant. The International Atomic Energy Agency said that the seized materials were "low grade and would not present a significant safety, security or nuclear proliferation risk". Reports suggested that ISIL captured Saddam-era chemical weapons from an Iraqi military base, and the group also enlisted the aid of scientists living in its territories to produce their own chemical weapons. ISIL managed to produce its own mustard gas, and employed it on battlefields in Iraq and Syria. According to one scientist involved in the project, the main value of the mustard gas to ISIL was not its impact on actual combat, but its effect in psychological warfare. The production of chemical weapons slowed greatly from early 2016, however, as the United States and the Iraqi government targeted production facilities and killed or captured the leaders of the programme. Regardless, it is generally believed that ISIL remains in possession of hidden data and equipment to restart the production of chemical weapons in the future. ISIL deployed mustard gas and chlorine gas against forces of the Iraqi government, the Syrian government and the Syrian opposition, as well as unidentified chemical weapons against the Syrian Democratic Forces. According to the US military, ISIL used the chemical weapons effectively on a tactical level, but never managed to employ them in a way that impacted the larger strategic situation. The group produced not enough chemical weapons, being hampered not just by airstrikes and raids, but also lack of skilled personnel and equipment. ^ "ISIS Proclaims 'Caliphate of Sinai'; Calls for Attacking Israel's Eilat". Algemeiner.com. Retrieved 23 December 2014. ^ "IS claims responsibility for Gaza's French Cultural Centre blast, reports". Middle East Eye. 8 October 2014. Retrieved 9 October 2014. ^ "ISIL fighters bussed from Lebanon-Syria border after first deal to surrender". Telegraph. Retrieved 29 August 2017. ^ Sherlock, Ruth (19 October 2014). "Islamic State foiled in attempt to kidnap Syrian rebel leader in Turkey". Telegraph. London. Retrieved 23 December 2014. ^ "Iran Says It's Under Attack by ISIS". The Daily Beast. 9 October 2014. Retrieved 13 October 2014. ^ a b c d "ISIS gaining ground in Yemen, competing with al Qaeda". CNN. 21 January 2015. Retrieved 21 January 2015. ^ a b "Officials confirm ISIL present in Afghanistan". Retrieved 13 February 2015. ^ a b "Pakistan Taliban splinter group vows allegiance to Islamic State". Reuters. 18 November 2014. Retrieved 19 November 2014. ^ a b c "The Maldives-Syria Connection: Jihad in Paradise?". Jamestown. 21 November 2014. Retrieved 16 May 2015. ^ a b c d e "Boko Haram swears formal allegiance to ISIS". Fox News. Associated Press. March 8, 2015. ^ a b "IS welcomes Boko Haram allegiance: tape". Yahoo! News. Agency French-Presse. 12 March 2015. Retrieved 12 March 2015. ^ a b Tin, Alex. "ISIS faction raises black flag over Somali port town". CBS News. Retrieved 27 October 2016. ^ a b "Senior Abu Sayyaf leader swears oath to ISIS". Rappler. Retrieved 13 February 2015. ^ a b c d e f "ISIS Now Has Military Allies in 11 Countries – NYMag". Daily Intelligencer. Retrieved 25 November 2014. ^ Peter Bergen, CNN National Security Analyst (8 March 2015). "ISIS goes global". CNN. Retrieved 22 March 2015. ^ a b Cockburn, Patrick (16 November 2014). "Islamic State has 200,000 fighters claims Kurdistan leader". The Independent. London. ^ "Islamic State formations comprise up to 70,000 gunmen — Chief of Russia's General Staff". Russian News Agency "TASS". 10 December 2014. ^ a b c "Saddam's former army is secret of Baghdadi's success". Reuters. 16 June 2015. Retrieved 1 July 2015. ^ "ISIS can 'muster' between 20,000 and 31,500 fighters, CIA says". CNN. 12 September 2014. Retrieved 6 July 2015. ^ Michaels, Jim (4 February 2016). "New U.S. intelligence estimate sees 20-25K ISIL fighters". USA Today. Washington, DC. ^ Sciutto, Jim; Starr, Barbara; Liptak, Kevin (4 February 2016). "ISIS fighters in Libya surge as group suffers setbacks in Syria, Iraq". Washington, DC: CNN. ^ "ISIS down to 6,500 fighters, holds only 3 percent of Iraq". Washington Examiner. 17 October 2017. Retrieved 12 November 2017. ^ Peter Dörrie, How Big Is Boko Haram?, Medium (February 2, 2015). ^ "Obama Is Pressed to Open Military Front Against ISIS in Libya". The New York Times. 4 February 2016. Retrieved 5 February 2016. ^ "ISIL's presence in Libya grows to 5,000 fighters". Al Jazeera. ^ Jim Sciutto; Barbara Starr; Kevin Liptak (4 February 2016). "More ISIS fighters in Libya; fewer in Syria and Iraq". CNN. ^ Murad Batal al-Shishani, Jordan's jihadists drawn to Syria conflict, BBC Arabic (October 30, 2012). ^ Taylor Luck, ISIL militants have launched a losing war on Jordan, The National '(April 2, 2016). ^ Daniella Peled, ISIS in Jordan: King Abdullah's Battle for the Soul of Islam, Ha'aretz (November 25, 2015). ^ Benjamin T. Decker, The Islamic State's Biggest Threat to Jordan Isn't Violence — It's Economics, VICE News (May 13, 2015). ^ Burak Ege Bekdil, Turkey Caught Nearly 1,000 ISIS fighters in 2015, Defense News (January 19, 2016). ^ Sinai Province: Egypt's ISIS Affiliate, Woodrow Wilson International Center for Scholars (May 19, 2016). ^ Sami Aboudi, In Yemen chaos, Islamic State grows to rival al Qaeda, Reuters (June 30, 2015). ^ Asa Fitch & Saleh Al Batati, ISIS Fails to Gain Much Traction in Yemen, Wall Street Journal (March 28, 2016). ^ Taimoor Shah & Joseph Goldstein, Taliban Fissures in Afghanistan Are Seen as an Opening for ISIS, New York Times (January 21, 2015). ^ Lynne O'Donnell, Islamic State group loyalists eye a presence in Afghanistan, Associated Press (September 8, 2015). ^ Maruf, Haran. "IS Militants Seize Town in Somalia's Puntland". voanews.com. Voice of America. Retrieved 27 October 2016. ^ "Algerian Army Kills Militant Leader Linked to Beheading of French Hostage". The New York Times. 24 December 2014. ^ "Algeria's al-Qaeda defectors join IS group". Reuters. September 14, 2014. ^ a b ISIS's Growing Caliphate: Profiles of Affiliates, Woodrow Wilson International Center for Scholars (February 19, 2016). ^ ISIS flag in Kashmir valley worries Army, Times News Network (October 16, 2014). ^ Nick Paton Walsh, ISIS on Europe's doorstep: How terror is infiltrating the migrant route, CNN (May 26, 2016). ^ Alison Smale, Terrorism Suspects Are Posing as Refugees, Germany Says, New York Times (February 5, 2016). ^ "Officials: Top Islamic State leader killed in Afghanistan strike". The Washington Post. 11 July 2015. ^ Bilger, Alex (22 May 2014). "ISIS Annual Reports Reveal a Metrics-Driven Military Command" (PDF). Institute for the Study of War. Retrieved 6 July 2014. ^ Vick, Karl; Baker, Aryn (11 June 2014). "Extremists in Iraq Continue March Toward Baghdad". Time. Retrieved 23 June 2014. ^ a b "Military Skill and Terrorist Technique Fuel Success of ISIS". New York Times. 27 August 2014. Retrieved 21 October 2014. ^ McClam, Erin (2 July 2014). "Rising Star of ISIS Has Chechen Background and Fierce Reputation". NBC News. Retrieved 15 August 2014. ^ Masi, Alessandria (3 July 2015). "Inside 'The Caliphate Army': ISIS's Special Forces Military Unit Of Foreign Fighters". International Business Times. Retrieved 21 July 2015. ^ "ISIS Al-Khansa brigade: Meet the women the Islamic State use to dish out brutal punishment". NewsComAu. 22 October 2014. Retrieved 13 February 2015. ^ staff. "Islamic State said to be coaching Sinai militants". www.timesofisrael.com. Times of Israel. Retrieved 23 November 2014. ^ Lewis, Jessica (12 June 2014). "The Terrorist Army Marching on Baghdad". The Wall Street Journal. Retrieved 23 June 2014. (subscription required) Accessible via Google. ^ "IS has 20,000–31,500 fighters in Iraq and Syria: CIA". Yahoo! News. 12 September 2014. Retrieved 12 September 2014. ^ "Islamic State 'has 50,000 fighters in Syria'". Al Jazeera. 19 August 2014. Retrieved 19 August 2014. ^ "ISIS has 100,000 fighters, growing fast – Iraqi govt adviser". RT. Retrieved 2 October 2014. ^ "Kurdish Officials Worry About Kurds Joining The Islamic State". NPR.org. 16 December 2014. Retrieved 16 May 2015. ^ "1,000-strong Syrian rebel brigade defects to Islamic State – report". Retrieved 24 February 2015. ^ "Two Arab countries fall apart". The Economist. 14 June 2014. 14 June 2014. Retrieved 18 July 2014. ^ "The Syrian rebel groups pulling in foreign fighters". BBC News. 24 December 2013. Retrieved 24 December 2013. ^ "Chechen fighter emerges as face of Iraq militant group". Fox News. Associated Press. 2 July 2014. ^ Schmidt, Michael S. (15 September 2014). "U.S. Pushes Back Against Warnings That ISIS Plans to Enter From Mexico". The New York Times. Retrieved 16 September 2014. ^ Yeginsu, Ceylan (15 September 2014). "ISIS Draws a Steady Stream of Recruits From Turkey". The New York Times. ^ Kirkpatrick, David D. (21 October 2014). "New Freedoms in Tunisia Drive Support for ISIS". New York Times. ^ "Det jag har bevittnat i al-Raqqa kommer alltid förfölja mig". Nyheter Världen (in Swedish). Dagens Nyheter. 23 September 2014. Retrieved 25 September 2014. ^ Revathi Siva Kumar. "UN Report On 15,000 Foreigners Joining ISIS Fighters In Syria And Iraq Will Shock You". International Business Times AU. Archived from the original on 10 November 2014. Retrieved 13 February 2015. ^ Sarhan, Arme. "CIA: 30,000 foreign fighters have traveled to Syria and Iraq to join ISIS". Iraq News. Sep 29 2016. ^ Global Terrorism Index 2015. Institute For Economics and Peace. October 2015. Pages 46-47. ^ a b c d e f g h i j k l m n o p q r s t u v "Iraq and Syria: How many foreign fighters are fighting for Isil?". The Telegraph. ^ Mansur Mirovalev, quoting Vladimir Putin. "How Russia spawned more ISIL fighters than most nations." October 31, 2017. Al Jazeera. Retrieved January 8, 2018. "Russian President Vladimir Putin said in February that "up to 4,000" Russian nationals fight for ISIL. In June, he said that ISIL is "preparing plans to destabilise" ex-Soviet Central Asia and Russia's southern regions." Note: the Global Terrorism Index cited the Russian Foreign Ministry as giving the number of Russian citizens in ISIS as 2,400 as of October 2015. ^ "Jordan Waits On Fate Of Its ISIS Prisoner". NPR. 1 February 2015. Retrieved 15 April 2015. . 1,500 was the reported number as of February 2015. ^ Withnall, Adam (23 June 2014). "Iraq crisis: Isis 'has recruited at least 1,500 Britons' to fight abroad, warns Birmingham MP". The Independent. London. Archived from the original on 24 June 2014. Retrieved 16 May 2015. . Alternative estimate of 1,500 is given by Birmingham MP. ^ "Number of ISIS Recruits in Indonesia Tripled in Recent Months". International Business Times. 9 December 2014. ^ "Top analyst says some 640 Belgians linked to Syria fighting". Fox News. Associated Press. Retrieved November 17, 2016. ^ El-Naggar, Mona (18 February 2015). "From a Private School in Cairo to ISIS Killing Fields in Syria (With Video)". The New York Times. ^ Casey Michel. "Central Asia as a Source of ISIS Militants". The Diplomat. Retrieved 15 April 2015. ^ a b Amre Sarhan (30 April 2015). "130 Macedonian and Serbian nationals fight alongside ISIS in Iraq and Syria". Iraqi News. Retrieved 11 April 2017. ^ a b Tomovic, Dusica (17 September 2014). "Hundreds of Balkan Jihadists Have Joined ISIS, CIA Says". Balkan Insight. Retrieved 23 January 2015. ^ "Azerbaijan Assesses the Growing Threat of ISIS". 4 February 2015. Archived from the original on 2 April 2015. Retrieved 29 March 2015. ^ "Kosovo indicts 32 for fighting and recruiting for Islamic State". Reuters. 7 May 2015. Retrieved 11 August 2015. ^ Stephen Schwartz. "In Kosovo, U.S.-Funded Study Gets Response to ISIS Wrong". Middle East Forum. Retrieved 11 August 2015. ^ "Report: 250 Americans Have Gone To Syria And Iraq To Fight". NPR. ^ "Barack Obama vows to use 'all of our tools' to fight ISIS as report shows more than 250 Americans have left U.S. to join terrorist groups". New York Daily News. ^ "IS recruiting in SA - report". News24.com. 23 November 2014. ^ "Canadians have joined ISIS to fight – and die – in Syria". CNN. 10 September 2014. Retrieved 3 January 2015. ^ "Georgian Ex-President Says 'Hundreds Of Georgians Fighting With IS In Syria'". RadioFreeEurope/RadioLiberty. Retrieved 15 April 2015. ^ Al-Jazeera. "The London-based International Centre for the Study of Radicalisation estimates that just 120 people from Israel are now fighting in Syria and Iraq." , "Israelis Are Joining ISIS". Vocativ. 7 November 2014. Retrieved 3 January 2015. "According to Israeli security service estimates, there are now 40 to 50 Arab-Israelis fighting in Syria and Iraq, most of them as part of ISIS. That's not a huge number, given that there are 1.3 million Muslims living in Israel. " ^ "Israelis Are Joining ISIS". Vocativ. 7 November 2014. Retrieved 3 January 2015. ^ "Most Indian youngsters who joined terror outfit ISIS are based in Raqqa: Report". India TV. 5 November 2016. ^ Team, dna Web (2015-12-26). "ATS arrests three men from Nagpur airport for planning to join ISIS". dna. Retrieved 2015-12-26. ^ Mitra, Devirupa (21 September 2014). "Not Four But 20, Says Iraqi Envoy of Indian ISIS Fighters". The New Indian Express. Retrieved 3 June 2015. ^ "ISIS boasts rising number of recruits among Iranian Kurds". Rudaw. Retrieved 15 April 2015. ^ Doyle, Kevin (21 November 2015). "40 people left Ireland to fight with IS - Alan Shatter". Irish Independent. Retrieved 7 December 2015. ^ "John Key: Kiwi forces will help train Iraqis fight ISIS". The New Zealand Herald. 5 November 2014. Retrieved 15 April 2015. ^ "Existem 12 jihadistas portugueses no Iraque e Síria". The Daily Star Lebanon. 2 September 2014. Retrieved 10 January 2015. ^ "Ghanaians joining Islamic State highlight potential for religiously motivated gun attacks against busy outdoor entertainment spots in capital". Janes. 15 October 2015. Archived from the original on 19 October 2015. Retrieved 24 October 2015. ^ "Väčšina Slovákov bojujúca za ISIS zahynula, tvrdí Martvoň". Topky. 3 July 2015. Retrieved 25 January 2016. ^ "Nine Japanese said to have joined ISIS". The Daily Star Lebanon. 26 September 2014. Retrieved 3 January 2015. ^ "8 people in Taiwan have shown interest in joining ISIS: NSB". FocusTaiwan.tw. 28 March 2016. Retrieved 9 October 2017. ^ "Polacy walczą po stronie islamistów?". tvn24.pl. 15 January 2015. Retrieved 3 January 2015. ^ Žabec, Krešimir (14 June 2015). "Otkrivamo detalje izvješća o radu SOA-e: 'U zadnji tren smo spriječili prelazak Hrvata teroristima!'". Jutarnji list (in Croatian). Retrieved 14 June 2015. ^ "At least two Singaporeans have joined Isis, says DPM". Retrieved 16 May 2015. ^ "South Korean teen has joined Islamic State group in Syria: official". Global News. 24 February 2015. Retrieved 22 March 2015. ^ "New English ISIS Video Stars Chilean Jihadist; Mocks Obama, US Soldiers with Diaper Jokes". International Business Times, India Edition. July 1, 2014. Retrieved 19 November 2015. ^ "ISIS fighter from Finland claims Latvian recruit". lsl.lv. 26 February 2015. Retrieved 22 March 2015. ^ "Estonians fighting in Syria forcing local Islamic community to become more strict". ERR. 27 January 2015. Retrieved 15 April 2015. ^ a b "With Cash And Cachet, The Islamic State Expands Its Empire". NPR.org. 18 November 2014. Retrieved 13 February 2015. ^ "Ansar al Sharia Libya relaunches social media sites". Long War Journal. 9 April 2015. Retrieved 10 April 2015. ^ "Egyptian militant group pledges loyalty to Islamic State in audio clip". Reuters. 10 November 2014. Retrieved 11 November 2014. ^ David Von Drehle (26 February 2015). "What Comes After the War on ISIS". TIME.com. Retrieved 22 March 2015. ^ "Taliban splinter group in Pakistan vows allegiance to ISIS". al-akhbar. 18 November 2014. Retrieved 19 November 2014. ^ "IMU Declares It Is Now Part Of The Islamic State". Radio Free Europe/Radio Liberty. 6 August 2015. Retrieved 6 August 2015. ^ "Mapping the emergence of the Islamic State in Afghanistan". Long War Journal. Foundation for Defense of Democracies. 5 March 2015. Retrieved 10 March 2015. ^ Withnall, Adam (26 April 2015). "Boko Haram renames itself Islamic State's West Africa Province (Iswap) as militants launch new offensive against government forces". London: The Independent. Retrieved 23 August 2015. ^ "ISIS Declares Governorate in Russia's North Caucasus Region". Institute for the Study of War. 23 June 2015. ^ "ISIS: We Are Operating in Gaza". ^ "Islamic State Attacks Israel: ISIS Supporters Threaten Hamas, Take Credit For Launching Rocket From Gaza". ^ Paterno Emasquel II (17 September 2014). "Philippines condemns, vows to 'thwart' ISIS". Rappler. Retrieved 19 September 2014. ^ Caleb Weiss (15 October 2017). "Islamic State-loyal group calls for people to join the jihad in the Congo". Long War Journal. Retrieved 16 October 2017. ^ "Centre Has Taken Note Of ISIS Claiming First Attack In Kashmir: Minister". NDTV.com. Retrieved 2018-01-15. ^ Zavadski, Katie (August 23, 2017). "ISIS Uses American Boy to Threaten Trump in New Video". The Daily Beast. Bloom's research shows that children are used not just as propagandists but also as soldiers in the terrorist group's operations. ISIS uses nearly two dozen children a month in operations, Bloom said. ^ McLaughlin, Erin (February 22, 2016). "How ISIS recruits children, then kills them". CNN. Retrieved September 3, 2017. ^ Bloom, Mia; Horgan, John; Winter, Charlie (February 18, 2016). "Depictions of Children and Youth in the Islamic State's Martyrdom Propaganda, 2015-2016". CTC Sentinel. ^ Ismay, John (17 October 2013). "Insight Into How Insurgents Fought in Iraq". The New York Times. Retrieved 22 August 2014. ^ a b "Not Just Iraq: The Islamic State Is Also on the March in Syria". The Huffington Post. 7 August 2014. Retrieved 11 August 2014. ^ a b c Gibbons-Neff, Thomas (18 June 2014). "ISIS propaganda videos show their weapons, skills in Iraq". The Washington Post. Retrieved 11 August 2014. ^ "US-made Stinger missiles have likely fallen into ISIS hands, officials say". Fox News Channel. 16 June 2014. Retrieved 21 June 2014. ^ a b c Jeremy Bender (9 July 2014). "As ISIS Routs The Iraqi Army, Here's A Look At What The Jihadists Have In Their Arsenal". Business Insider. Retrieved 11 August 2014. ^ Prothero, Mitchell (14 July 2014). "Iraqi army remains on defensive as extent of June debacle becomes clearer". Stars and Stripes. Retrieved 15 July 2014. ^ Chelsea J. Carter; Tom Cohen; Barbara Starr (9 August 2014). "U.S. jet fighters, drones strike ISIS fighters, convoys in Iraq". CNN. Retrieved 5 September 2014. ^ "ISIS Holds Military Parade in Mosul". Long War Journal. 24 June 2014. Retrieved 26 February 2018. ^ Tilghman, Andrew; Schogol, Jeff (12 June 2014). "How did 800 ISIS fighters rout 2 Iraqi divisions?". Military Times. Archived from the original on 12 June 2014. Retrieved 14 June 2014. ^ "State of emergency: ISIS militants overrun Iraq city of 1.8mn, free 2,500 prisoners". RT News. 18 June 2014. Retrieved 22 July 2014. ^ "Isis leader calls on Muslims to 'build Islamic state'". BBC News. 1 July 2014. Retrieved 2 July 2014. ^ Semple, Kirk; Schmitt, Eric (26 October 2014). "Missiles of ISIS May Pose Peril for Aircrews". The New York Times. ^ "Islamic State training pilots to fly in three jets: Syria monitor". Reuters. 17 October 2014. Retrieved 17 October 2014. ^ Holmes, Oliver (22 October 2014). "Syria says shoots down two of three Islamic State jets". Reuters. Retrieved 22 October 2014. ^ a b "Death of Abu Jandal al-Kuwaiti". CJTF–OIR. 29 December 2016. Retrieved 30 December 2016. ^ Cowell, Alan (10 July 2014). "Low-Grade Nuclear Material Is Seized by Rebels in Iraq, U.N. Says". The New York Times. Retrieved 15 July 2014. ^ Sherlock, Ruth (10 July 2014). "Iraq jihadists seize 'nuclear material', says ambassador to UN". The Telegraph. London. Retrieved 15 July 2014. ^ "Does ISIL/ISIS Pose Chemical Threat? – Green Cross". Retrieved 6 November 2014. ^ a b c Joby Warrick (21 January 2019). "Exclusive: Iraqi scientist says he helped ISIS make chemical weapons". The Washington Post. Retrieved 14 February 2019. ^ Al Jazeera and agencies. "Iraqis say ISIL used chlorine gas in attacks". Retrieved 6 November 2014.